Neil Warnock says it will be "virtually impossible" for his Cardiff City team to beat Liverpool on Saturday. Cardiff face second-placed Liverpool after their first Premier League victory of the season against Fulham. "We've all got to play at the top of our potential to give them a good game and hope they have an off day," said Cardiff's boss before the Anfield game. 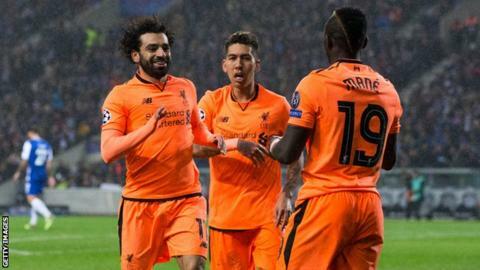 "I think their front three [Mohamed Salah, Roberto Firmino and Sadio Mane] is probably the best in the world." "But I think we can go there and cause problems," added the 69-year-old. "I hope the lads are looking forward to it - it's a special place in football, a remarkable place. It's massive." Cardiff climbed out of the Premier League relegation zone with victory over the Cottagers but Liverpool have not lost at Anfield in the league since Crystal Palace won there in April 2017. They have suffered two defeats in all competitions this season - one in the Champions League and one in the League Cup - with their improvement in defence one of the reasons for their consistency. The Reds have conceded only three goals in nine Premier League matches, a record that owes much to the summer arrival of Brazil keeper Alisson and the January purchase of Netherlands centre-back Virgil van Dijk. When the Dutchman signed for a world-record £75m, Warnock suggested Cardiff's Sol Bamba was a better defender. "I think I'd been drinking if I'm honest," said Warnock when reminded of his comment. "What I meant was if Van Dijk was in our team, you'd see if he was a good defender. He doesn't have to defend that much in Liverpool's team because they're usually in the other half. "I think they've improved with the players they've brought in. "I'm delighted Van Dijk is playing like he is because I think we could have bought him at Palace for £6m but my chief scout said he was too slow. I think he's still in a job as well! So it just shows you what opinions are about."